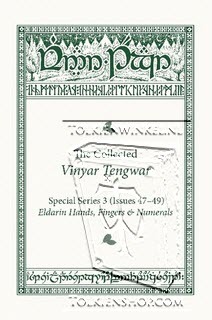 Vinyar Tengwar is a journal of the Elvish Linguistic Fellowship a special interest group of the Mythopoeic Society. The current issue presents previously unpublished writings by J. R. R. Tolkien concerning his Elvish languages. These have been edited and annotated by Christopher Gilson, under the guidance of Christopher Tolkien and with the permission of the Tolkien Estate.